Starting A Brand? Where's Your Responsible Packaging? This week we discuss the hunt for ethical packaging – a total “Must” for designers today. Consumers are more and more fussy about their packaging – I’ve known customers to be put off a purchase because it came wrapped in so many unnecessary layers. Choose Prime Packaging for the best-personalized service you ever need in packaging. A few months ago I discovered lingerie designer Jessica (well, technically she discovered us on her hunt for ethically sourced fabrics). Having just graduated, she is taking the plunge and setting up her own lingerie label, and is now on the most incredibly journey. As some of you will know, setting up a brand can be the most exciting but challenging few months (even years!) you will experience. So since this blog is all about sharing knowledge, I’ve persuaded Jess to document her developments so we can learn from (and steal) some of her brilliant ideas! It has been a couple of weeks since my first blog post and a lot has happened since: I attended Graduate Fashion Week (GFW) in The Truman Brewery and was also shortlisted for the GFW Ethical Award! I also completed a three day enterprise summer school to learn more about being an entrepreneur. It was a fantastic experience and I learned a lot. It was also great to get some enthusiastic feedback about my project which made me excited to take it to the next level. I was also working very hard on my brand’s responsible packaging! For me, packaging is almost as important as the product itself. Because I want everything about my brand to be more responsible and eco-friendly, the packaging had to be ethically sourced as well. This is where the challenge started, because I also wanted it to look pretty and luxurious – words not often associated with sustainability! But if you buy beautiful underwear you want to feel like you are taking home a little gift for yourself, or for somebody else! 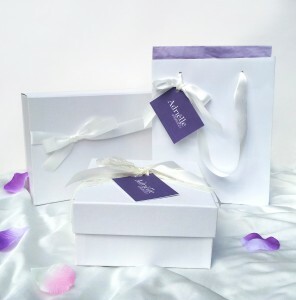 After some research I was able to find some really nice white gift boxes made from recycled board and white paper bags made from recycled paper but with a beautiful, luxurious shine. To finish them off, I decided to make bows out of ribbon and found a lovely quality acetate satin ribbon. The acetate satin ribbon is made from cellulose, which is extracted from wood pulp from by-products of wood crafting. This means it is a much more environmentally friendly ribbon compared to polyester alternatives. To match the colours of the brand I decided to also use some purple tissue paper for in the bags and boxes. The tissue paper is recyclable and printed with eco-friendly soy based inks. It is produced with high recycled content, SFI certified and free from chlorine. 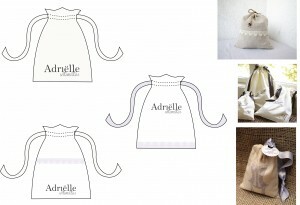 I also decided to design fabric bags as a way to protect a customers’ purchase. This would also double up as a pretty place to store delicate underwear and bras, and a handy accessory for traveling. Sadly I haven’t had time to actually make them yet, but I’ve bought some lovely bamboo silk for these. 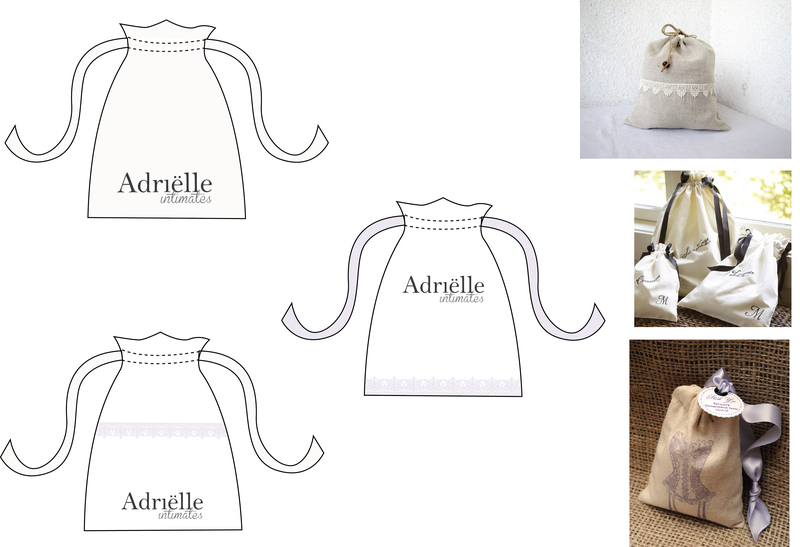 If you didn’t want to spend more on making the bags, why not use leftover fabric? Not only will you protect your products and prevent damage and a shortened product life, but it’s also a great way to reduce the waste from your creations. If you’d like to keep up with all of these stories, please do sign up to my monthly newsletter, where I’ll round up the most popular posts so you won’t miss a thing! I invented a high fashion, Eco /Friendly lunch bag /handbag for women. High end vinyl mills where I can purchase vinyls at a better price than going through a store such as Joseph Noble in Dallas.